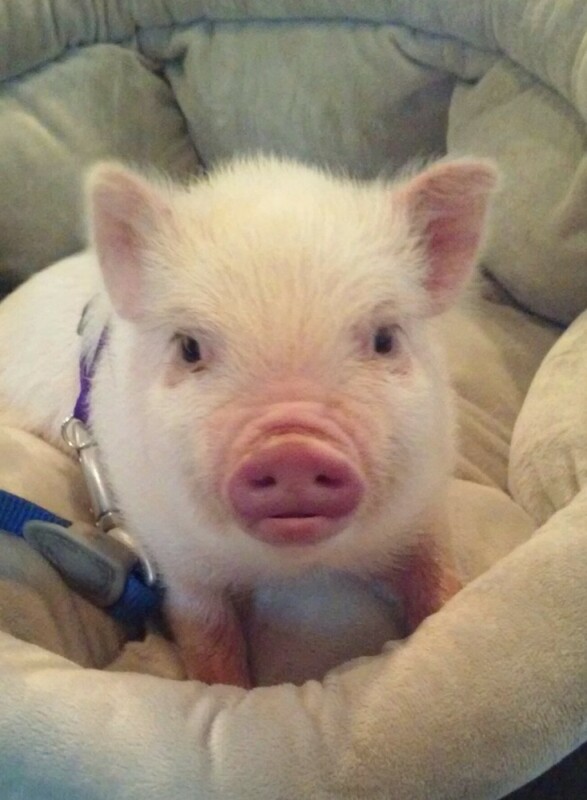 Oscar is a miniature potbellied pig with tons of personality and attitude. He is funny, cuddly, smart, and challenging (the squealing!). Get to know him as he works to figure out the world in some funny and occasionally frustrating ways! Watch Oscar grow, see how he settles in at home, or just follow as he enjoys life. 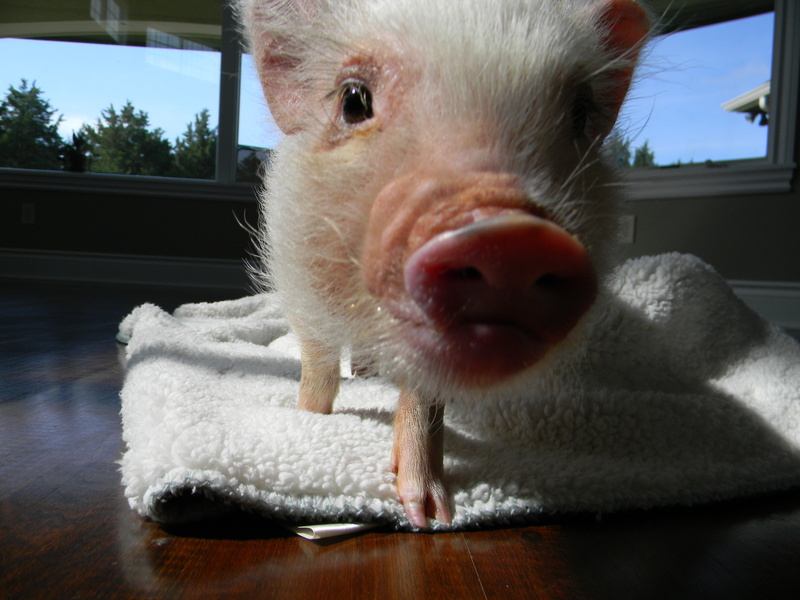 If you want to learn more about mini pigs, check out the mini pig FAQs. Where did you purchase Oscar? I am looking into purchasing a mini pig and am still deciding the best place to buy. Thanks! I am also curious as to where you got Oscar? there are so many websites but I can’t find the right one for a mini potbelly pig- I mostly find Julianna pigs! Pig Association) registered breeders list on the AMPA website. Their list includes breeders who have taken extra steps to register their breeding pigs and who have agreed to follow the AMPA code of ethics and provide proof of age and photo documentation of the measurements of their pigs. You can see the list here: http://americanminipigassociation.com/owners/find-breeder/. I was wondering where your purchased your piggy, I’ve been looking and haven’t found a place. Can you also write about grooming, and how you take care of Oscar in that aspect. Like baths, hoove care, and that sort of thing. Do you let him roam around freely when y’all are gone? Also where did you purchase him and what is his current weight and height? I clicked on the watch Oscar grow link but it’s not showing up. Hi Brittany! We don’t let him roam around freely when we’re away from home. I don’t need to leave him for too long, so he stays in his crate with his bed while I’m away. I know a lot of other people section off small rooms for their pigs and use a potty box if they need to be away for longer periods of time. Pigs can get into a lot of things (especially food), and I’m always worried Oscar will get into toxic food or eat something he shouldn’t while I’m not watching him, so that’s the primary reason I don’t let him roam freely when we’re not home. He just turned a year old and is 28 pounds. I sent you an email about his breeder. Hope that helps! Thank you!!! :) On http://americanminipigassociation.com/owners/find-breeder/ do u buy mini pigs or does it help u find breeders in your area? Sorry…I must have missed your question in my comments queue and just now saw it! It helps you find breeders in your area. I was wondering if miniature pigs make noise when they are home alone and if the smell? Hi Julia. I answered your question posted on the other page, and you can see it here: http://lifewithaminipig.com/meet-oscars-family/. So i just got a mini pig about 2 weeks ago and absolutely in love with him. His name is cohen and 6 weeks old but im so worried about not training him right and him not liking me! Hi Shayna! I wouldn’t stress about it too much! For now, just spend time with Cohen and let him get used to you. Now is a good time to just get to know him and let him get to know you. Once you feel comfortable and he seems ready, you can start doing some really short training sessions. I recommend training circle/spin first just because it’s fun and easy to train and, while I recommend training when they’re young, make sure you focus first on just getting him comfortable at home and around you. If you try a training session and he doesn’t seem ready, hold off and then try again another time and see if he seems ready then. That’s a good way to just feel out when it’s time to train, but I think it’s awesome you’re so committed to training him because it’s good for discipline and a good bonding time for you both. 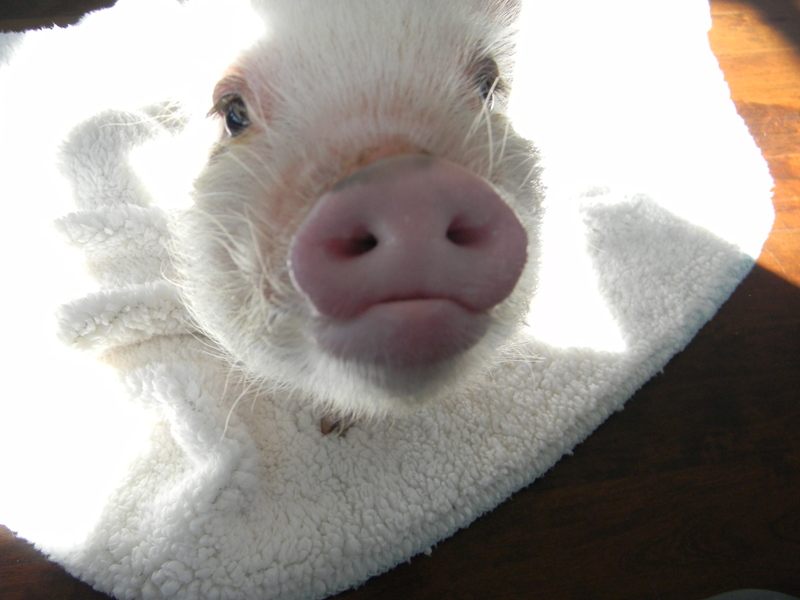 I am considering a mini pig, but am quite cautious about it. Please share your breeder info as I am quite concerned with getting a mini pig that wouldn’t be so mini. I would be interested in speaking with a reputable breeder. Thank you! I just found your blog, but I don’t see any updates the past four months. Are you all okay? Is Oscar OK? Mini pigs dont really exist. It is rather unhealthy fr a full grown pig to be under 50 pounds. I hope your Oscar will not suffer from this abuse. Miniature pigs are also susceptible to many serious health conditions. Dont get frustrated when he reaches 200 lbs like mine. Hi, i bought a mini pig named Charlotte one month ago and i was stressed out because the bounding doens’t go so smoothly. But than i read your blog about how long iT could take and i was relieved about your comment that i just have to give her all the time and just be patient. I was already starting to think she doesn’t like me. So thanks a lot for giving me a boost to just go on with lots of love and treats… Big hugs from me and little Charlotte. Greetings from Belgium. How big is Oscar now ? Is he 2 years ?